Two men with ties to Hezbollah conducted “pre-operational surveillance” on possible targets for attack in New York, as well as U.S. and Israeli embassies in Panama, federal prosecutors said Thursday. Jonathan Dienst reports. Two men with ties to Hezbollah conducted “pre-operational surveillance” on possible targets for attack in New York, as well as U.S. and Israeli embassies in Panama, federal prosecutors said Thursday. No specific plot was underway but the men were allegedly scouting the targets to assess their vulnerabilities, including LaGuardia Airport and FBI headquarters in New York. The two men allegedly received weapons and bomb-making training in Lebanon. 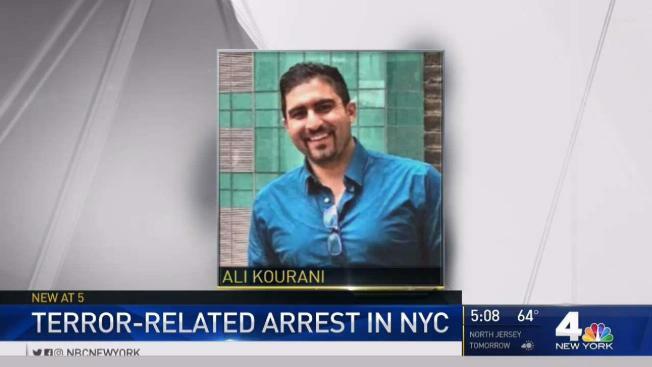 Ali Kourani, of the Bronx, was arrested last week on the terror-related charges. Samer El Debek was arrested in Livonia, Michigan, and sent to New York last week for trial. Kourani attended Hezbollah-sponsored weapons training program starting at age 16, and lied on his immigration application, stating he had no ties to any foreign terrorist organization, the FBI said. He became a naturalized citizen in 2009. El Debek allegedly joined Hezbollah in 2008 and traveled to Lebanon for training on numerous occasions, officials said. Investigators said he undertook bomb-making training while there. Officials said in 2009 he traveled to Thailand on his U.S. passport to help clean up explosive residue left behind in a safehouse used by members of a Hezbollah backed terror cell. In 2011, he allegedly went to Panama to photograph the American and Israeli embassies security measures. In 2012, he went back to scout vulnerabilities of the Panama Canal, officials said. Acting U.S. Attorney Joon Kim called the terrorism charges “serious,” adding Debek and Kourani "received military-style training, including in the use of weapons like rocket-propelled grenade launchers and machine guns for use in the support of the group’s terrorist mission." NYPD Commissioner James O’Neill said the men were involved in “pre-operational surveillance” in New York. Hezbollah is a Shia organization in Lebanon founded in the 1980s after Israel’s invasion there. With support from Iran, the group has been involved in numerous terrorist attacks – some which killed Americans. At the request of law enforcement, NBC New York did not report news of the investigation last week because officials cited ongoing security concerns connected to the case. Documents associated with the case were made public Wednesday. Debek’s family did not answer requests for comment at the Michigan home. Attempts to reach Kourani’s attorney Peggy Cross-Goldenberg and Debek’s attorney Robert Soloway were not immediately successful. Prosecutors said both men have already appeared in court and are being held without bail.